Its springtime beautiful season and eventually the sweet summer afterward, which implies the return of the noisy winged annoying wasps in your back yard or your walls one more time. It additionally implies we can all concurred we would certainly be better without them. Taking pleasure in being prepared to shoo away those wasps as well as expecting nests to show up so we can safely remove them. There are a couple of points you can do to stop them from constructing a nest near home backyard. Reviewing several of those choices right here, and also cover other methods maintaining from disturbing your lovely spring & summer seasons. Hang a disturbing light at night; they like dark spots, so generally will not construct a nest in night time lit locations. A boring light bulb will certainly do the job, it does not require to be also flashy brilliant. Hang a phony nest around; Wasps are territorial, so they will certainly commonly prevent developing a nest near where there currently is one. You can purchase a phony nest from the shop, or you can make one utilizing a paper bag or brownish plastic bag. start hanging it just as the spring start immediately. Once they nest, It’s too late to be placed afterward … it won’t work!!! Eliminate dropped fruit anywhere around the house; Generally, wasps are drawn into anything pleasant, so leaving dropped fruit from any type of fruit trees in your lawn is a straight invite for them. It’s really recommended to take these trees off your backyard since they attract all types of pests as a general rule of thumb. Seal any splits along exterior structure; soffits, window wells as well as all weep holes before nest building by the aggressive yellow jacket. This type of wasps kind is the hardest nest to manage, so is entitled to attentive preventative steps. Maintain your waste container secured; Wasps are attracted to the fragrance of rubbish, so maintaining your containers secured and also far from windows and doors will certainly stop them from fancying nesting around. Usage necessary mixed oils to inhibit them from nesting: Wasps are negative to the fragrance of citronella & menthol. Make a mix of these out infusers around. Wasps catches around the house exterior: You can quickly get wasp catches, or you can make them nearly as conveniently. Locate a catch in a couple of areas around the backyard to attract wasps in the direction, away from your house instead. Absolutely nothing attracts wasps in greater than wonderful aromas! Maintain wasps away by reducing those fragrances airborne. Requiring A Wasp Nest Removal? Maximum Can Help! 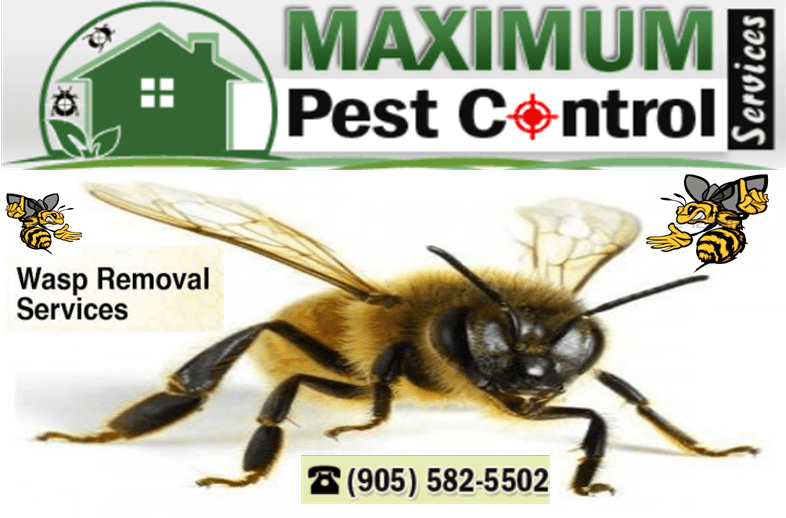 While you can frequently eliminate a wasp nest on your own besides the yellow jacket nests- those are harder as well as normally require an expert such as MaximumPestControlServices, it’s normally suggested to call a wasp removal specialist www.maximumpestcontrol.ca to eliminate the nest safely. If you’re sensitive or scared of wasps, you absolutely do not wish to do it on your own! Wasps are bothersome either in the backyard or inside your residence. Luckily there are a couple of points as mentioned above to stop them coming your way. If you do discover a wasps nest in your backyard or your walls and soffits, you can reliably count on Maximum wasps removal service Calling Now (905) 582-5502 or (289) 396-5426 to aid your wasps expulsion from commercial businesses and residential homes and condominiums nearby Oakville, Mississauga, Burlington & Hamilton – Zapped By Maximum in ASAP!